What wine to pair with Indian Grilled Cheese? There are a LOT of amazing things India is known for, and food is pretty much at the very top. It is a country of a billion with almost a billion things to eat. India as a whole is like Europe in the sense that, every state is like its own country with its own varieties of languages, food, culture, and so on. But, there is one thing that is NOT at the top of the Indian food items - cheese! Growing up there was one word that was synonymous to cheese, like Google is now synonymous to search. It was AMUL. This brand of cheese is all I knew when I dreamed about cheese as a child. Cheese was also a rare commodity in Indian households because of how expensive it was. So, if my mom mentioned a simple 'toast' for an evening snack, my brother and I would look at each other and jump up in joy. Because, toast meant there is going to be some cheese along with it in the table! While on the topic of AMUL cheese, I have to mention another reason why this brand of cheese is so dear to many Indians like me - they have the BEST advertisements on the ad bill boards all over the Indian cities. AMUL had some of the funniest, yet intelligent marketing advertisements I have ever seen. The advertisements were all very current and relevant to either Indian politics, sports or the Bollywood movie industry. As a child and teenager, window shopping along the streets of Chennai, I vividly remember gaping at these AMUL advertisement boards and breaking in to a huge smile EVERY time. This article does a good job explaining about the amazing marketing campaign strategy adopted by the AMUL brand. Anyway, after I came to the US, one of the first things that caught my attention was... cheese! All the varieties, shapes and sizes of cheeses available was beyond my imagination. And the day I first tasted a gooey American grilled cheese sandwich is etched in my mind forever! And few days back, like a sign, I saw a post for an Indian grilled cheese recipe in my Twitter page. Thanks to @PataksCanada for the recipe which I adapted mostly (except, I made my own Mango-chutney based on this recipe - minus whole nigella seeds). And, I did not forget to shop for my dear AMUL cheese. 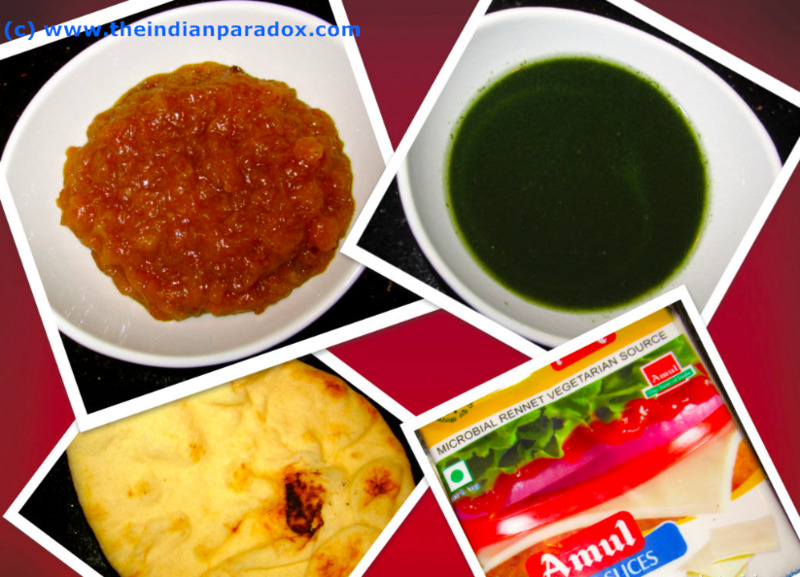 How can I make an Indian grilled cheese sandwich without AMUL? Then I collected all my ingredients for the recipe, assembled the "naan-sandwich" and warmed it up with a Panini press. Another thing that I have started paying more attention to, ever since being smitten and bitten by vino is, the divine world of all the cheeses that can be paired and devoured with wine. So, when I thought about this recipe and what wine to pair with it, I had a few wines as my top choices, but somehow a buttery (preferably unoaked) Chardonnay came out as a winner. And so I bought just that. This 2012 Luli Chardonnay from Santa Lucia Highlands (Monterey Bay), had enough acidity to cut through the fatty cheese. The Monterey bay's foggy, overcast weather has a lot to do with the grapes not fully ripening, resulting in a well balanced acidity in this wine. However, I will admit that this Chardonnay was not the most buttery Chardonnays that I have tasted. Next, the peach, apricot flavors come through which paired beautifully with the mango and mint chutney combination. Another key aspect was that, the sandwich mainly had the mango and cheese flavor, so the Chardonnay's medium-low body was tailor made for this. Every bite of the grilled cheese brought back warm, fuzzy memories of AMUL cheese and their funny ads I grew up with. Cheers to nostalgic memories, good food and wine!